I disagree with you Theo. I thought that yesterday we played to the same level as against Royston but our opponents were not as well organised. The one bright spot was Greene's goal. The defence is under almost constant pressure because there is little organisation in midfield or attack. Out forwards get the ball and all they can do is run with it without the interplay which is so necessary to create openings. There was one particularly ghastly moment late in the second half when a defender got the ball wide on the wing and just punted it forward so that it came back immediately. Of course the defence looks bad if the midfield and attack are not taking responsibility to keep possession. Why do we not learn from out opponents who play the ball out from defence. How often does Wright play the ball out to a defender to build an attack? Whilst our opponents do it nearly all the time. We dont play the ball out because our defenders cannot find the players in space. And, if they did, all the receiver would do is attempt to run with the ball rather than play it into space for other players to get involved. On a brighter note we did get to the Byeline once or twice and looked dangerous then. Our forwards and midfield are frequently caught in possession and do not support each other. Football is a team game after all. from A spectators point of view was a good game to watch end to end very open could have ended 5 all. However we looked far to open defensively big gaps between midfield and defence and no Aaron Greene starting arguable our best player. I think with the likes of montel and Greene both should play higher up the pitch be solid behind them and try giving them the ball as quickly and as often as we can they will make goals and score goals if we feed them more. I think we have the players too have a good season just need to play them with a bit more focus and structure cause our desire and work rate is good but we give the ball away too much cause we don’t seem to know where we should be focusing our attacks so more often than not we then play high and long. let’s now get on a good league run come on boys. I think that you misread what I wrote or I was not clear. When I said we played yesterday to the same level as Royston I meant that we played at the same level as WE DID against Royston. IMV we were not a patch on Royston and Staines were only slightly worse than Royston. Having read the previous three reports, even though I was unable to attend myself, in total they give quite a vivid picture of the pros and cons of last night game. is the lack of fluidity from back to front. all come back to one thing. Planning and Organisation. The part played during the match of the manager and coach can not be over emphasised. 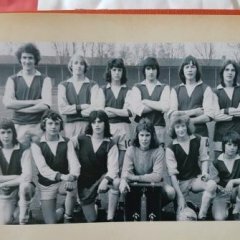 Before I am accused again of being an old duffer without credentials, amongst other things, I never went on the pitch without knowing the managers overall team strategy or my role within it. We accepted it was only the manager who initiate change. A philosophy which fortunately enable me to play against Man Utd at old Trafford in the FA Cup some 60+ years ago. that together with other experiences make some of my critiques rather over the top for some. Last weekI was able, at half time, to discuss the game with an old adversary of mine, who was a giant of his day in non-league football. Our first reaction was to be amazed that the same team came out for the second half. Also it took another 15+ minutes that something had to be down to curb the inter play of their midfield. Consequently it would be nice to hear, in my absence, that in future games a little more flexibility is being shown, so that ETfc's wish can be realised. Even with our current squad these can begin to be remedied on the training ground by the coach/manager, so long as they are ready to accept the deficiencies observed by the previous commentators. It is also necessary for them to be willing to adjust as the game evolves. What ever your feeling are towards BQ , he often showed a willingness to change tactics when events required them. For example the situation described by Theo. His suggestion to double up, which sounds a sensible view, based on his description of events as he saw them, had to be initiated again by the manager, otherwise the players would be accused of disrupting his overall defensive plan. Once again my PC is playing up and does not seem to allow me to edit my entry. I apologies if my previous comment appears disjointed and gobboldy-gook but the basics are there. But to paraphrase Eric Morecombe " most of the content is there but not necessary in the right order"
I have read Steph1 post about Royston and Theo you are being naughty again. I have said before you must read what is written and not what you think is written. Steph's opening sentence is quite unequivocal. Thanks Theo for your acknowledgement. I hope we will have lots more things to agree on especially if we continue to put our points of view rationally. In our different ways I am sure we both want the best outcome for the club. to see and that is for Ward-Cochrane to be given a start rather than his regular few minutes when he has little time to get into the game. It may be controversial but Blake's 2 goals in 21 appearances is very disappointing and perhaps it is time to try a change. Regarding the defence I wonder if any credence has been given to trying out Martin as one of the central defenders??? It's just a thought!!! which seems to utilise their individual abilities within a well rehearsed team plan. The continued selection of Blake is a mystery. His pace and mobility is an obvious plus but technical ability and lack of goals is a big issue. Ben Ward-Cochrane unfortunately is not going to be the answer IMO I’m afraid. We need a goal scorer who knows where the net is and can lead the line. Hard to find granted but we certainly don’t have one currently. I agree CD but my suggestion was based on our current personnel. It would be advantageous if were able to obtain the type of striker you suggest . I would also like us to have two or three mobile defenders. The question is where from. If and until our hopes materialise we have to contend with what we have got. The final outcome will always be determined by the management team, as is their right, but it does not stop us from giving a view. As things stand I for one would like to see some of the best of those recently acquired given a chance off the bench. How else can we judge. However, it seems the management deem none of them are ready for this yet hence the reason to off load them to other clubs on loan. Just curious.......is Harley still with us/injured? Not seen him since preseason.